Would you like to take better control of the skills you have listed on your Linked profile? Today’s article will show you how and answer some of the common questions I am asked about this, sometimes contentious, LinkedIn feature. LinkedIn provides the option for your connections to endorse you for skills you may or may not have listed on your LinkedIn profile. You can turn this feature off and should take control of those skills that are listed on your LinkedIn profile. LinkedIn will advise you that including specific skills on your LinkedIn profile is a great way to showcase your abilities to other members, such as your peers, colleagues, managers and even recruiters. While this is true, it has also been a way for sales people to get your attention and can sometimes be part of a sequence that social sellers use to try to get you into their sales pipeline. For this reason, this feature is contentious, because people who do not know you may in fact endorse you, and people can see who’s endorsed you for the skills you have listed on your profile. You can add a maximum of 50 skills to your LinkedIn profile and once you’ve added a skill, these can be validated by 1st-degree connections to reinforce their weighting. These are called skill endorsements, which are different than recommendations. When a connection endorses your skills, it acts as social proof (someone other than you saying you’ve demonstrated these skills) and can contribute to the strength of your profile, and increases the likelihood that you’ll be discovered for opportunities related to the skills you possess. Depending on your settings, you don’t need to request a skill endorsement in order to receive one. By default, when a connection endorses one of your skills you’ll receive a notification. You can visit your Settings and Privacy to turn this notification off. Select Skills from the dropdown. Type the name of a skill in the Skill text box and select it from the dropdown list that appears. Once selected, it will automatically be added to your list of skills. Adding specific skills to your LinkedIn profile allows you to showcase your abilities to other members, along with managers and recruiters. If you don’t have any skills listed on your profile, the Skills & Endorsements section won’t appear. Please note: You must have more than 3 skills listed in your Skills & Endorsements section for your skills to be categorised. Click the Me icon at top of your LinkedIn homepage. 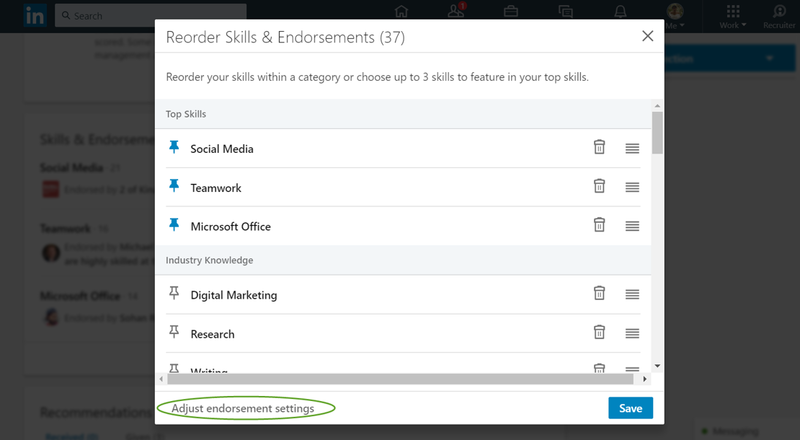 Scroll down to the Skills & Endorsements section and click the Edit icon. In the pop-up window, click and drag the Reorder icon (it looks like 4 stacked lines) to the right of the corresponding skill you’d like to reorder. You can choose up to 3 skills to feature in the Top Skills category. I am often endorsed for a variety of skills by people who do not know me. In my case I think this is because I write regularly and have a lot of readers. In this way, endorsements can be an asset as it is those people who perhaps value my insights that want to acknowledge particular skills. If you would prefer your connections not to endorse you, here’s some examples of the settings you can turn off or on. You can adjust the settings on your profile to manage how you receive and give skill endorsements. I hope this article has helped you take better control of your LinkedIn Profile skills and endorsements. Is there a way to block someone from endorsing me — someone I don’t know gave me 30 endorsements and I don’t want him showing up as an endorser. Is it possible to remove a skill that has endorsements and if so, is that something that is not good to do? Yes you can. It’s fine to do this if the skill is not relevant Lisa.